This is a huge issue with the new BMW R nineT tested at the Australian launch, as well the EBR 1190 RX finally tested at the track, on the road, at the drags and dyno’d to boot. We’ve also got the scoop on the Yamaha SR400 for those interested in a classic custom, as well as an Old School Test on the formidable GXS-R750T! Tweaked features include a mind blowing Kawasaki turbo ZX-12R, putting out over 500hp! There’s also a duo of custom French Honda fours and an awesome race inspired old school Honda CB900 Bol D’Or. Tech Tips include fitting a K&N performance airfilter, as well as the fourth installment in the engine rebuilding how-to, focusing on gearbox inspection, problem solving and assembly. There’s a great Sport Touring feature on the B73 Route, a full test on the Michelin Pilot Road 4s plus an interview with Aussie Streetfighters founder – Si. 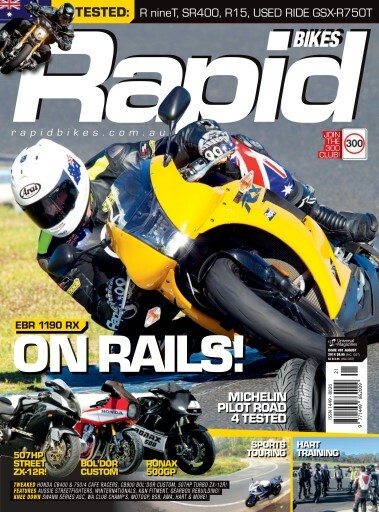 And of course all the regulars such as our staff bike CF Moto, and Hayabusa, Flipped with Matt Mingay and ET for your drag racing fix and all the regular columns with Ned Shaw, Mark Stenberg and Dave Manning. In the Knee Down track section you’ll find columns by Steve Brouggy, Andrew Pitt, Bryan Staring and Emma Bailey of EJB Exercise Physiology. We have a full feature on Honda Australia Rider Training’s (HART) track introductory course, as well as the second installment in converting your bike for racing. Plus all the latest in our On Track section, covering Australian and international racing!